Over 20 million people just in the United States alone struggle with Onychomycosis, commonly known as toenail fungus. Once fungus gets in and under a toenail it is very difficult to treat. Topical toenail treatments vary rarely work and oral medications can carry a risk of side effects and can be hard on your body. 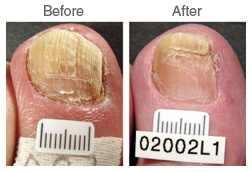 Now there is a revolutionary laser treatment that is now another option for the treatment of toenail fungus! The Doctors at The Foot & Ankle Associates are the only physicians presently in Northeastern North Carolina that offer this cutting edge technology. The gentle laser light works through the nail and penetrates the nail, nail bed, and nail root. We have utilized this treatment in our practice since February of 2009 and have found it to be a better treatment option for our patients with toenail fungus, especially for the patients that do not want or can not take oral medications. Because this treatment is considered aesthetic (cosmetic), health insurance plans do not cover this treatment. We accept cash, major credit cards, personal checks or you may use your Flexible Spending / Health Care Savings Account from work. We also offer an interest free payment plan through Care Credit. 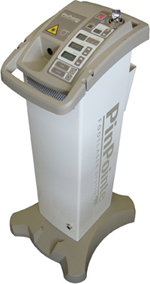 The laser treatment is applied to all of the toenails on both feet, even the ones that appear uninfected. This reduces the chance of reinfection and takes about 30 minutes. The treatment fee is no more than $600. Please call the office to discuss one or two infected toenails. 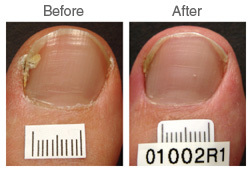 If the infection is resistant or has not responded with normal nail growth, the nails may need another laser treatment. An additional treatment within the first six months is discounted to $300.